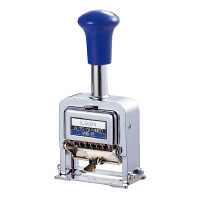 These are the highest quality numbering machines made anywhere in the world. 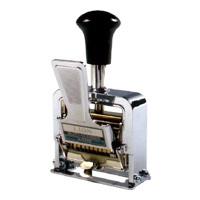 Lion machines are precision crafted of one-piece hardended steel and finished in a rugged, high-polish chrome. 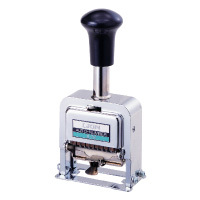 These machines are ideal for sequential numbering operations and will provide years of reliable service. Each machine with a bottle of black ink and adjustable stick. Special wheels available upon request. Samples from every single production run are torture-tested a minimum of one million times. 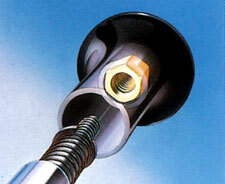 An embedded steel nut prevents stripping of handle threads by over tightening. 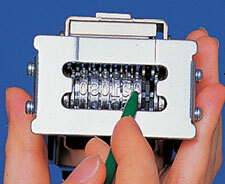 Movement indicator allows you to set your numbering machine to the desired movement. 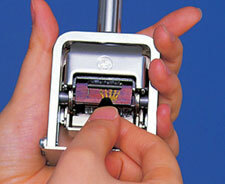 Easy to ink with hands-clean, simple procedure. You can drop out individual numbers by rendering wheels in a non-printing position. 0 - Repeat the same number indefinitely. Lever-action : Repeats the same number until the lever is depressed. 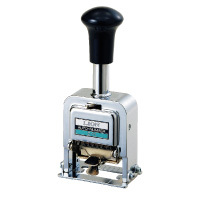 Special made rubber wheels allow numbering on metal, cloth, leather and wood. 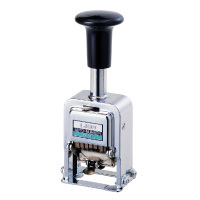 When stamping on metal surface, use Lion Metal Ink or Indelible Ink. 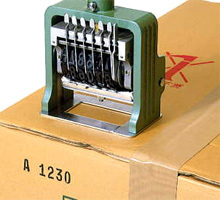 Large-size rubber wheel numbering machines for printing on cardboard, cloth, leather, wood. Convenience for transport management and quality control use. First wheel has A, B, C, D, E, F, G, H, ¥ and No. W130 x D95 x H300mm, 2 kgs. Use Lion Metal Ink or Indelible Ink. 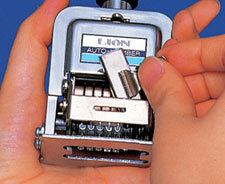 Refill ink for Lion numbering machine A, B, C and D-type. Do not use stamp pad ink or any type of marking ink. These inks will cause the numbering machine wheels to corrode. 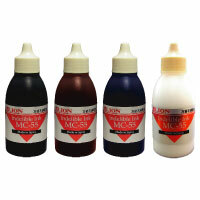 Use only LION Metal Ink LMN-1 for long lasting performance. 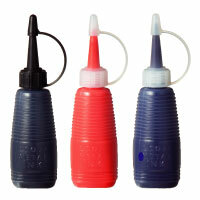 Black, Red or Blue. 30cc/plastic bottle. 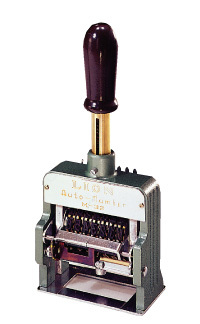 Refill ink for Lion numbering machine MM-21 and M-type. Versatile indelible ink ideal for most non-porous and semi-porous surfaces such as Metal, Glass, Plastic, Tile, Leather, Coated paper, Cardboard etc. Black, Red, Blue or White. 50ml/plastic bottle. Replacement inking pad for Lion numbering machine A-type. Size: W55 x D11 x H7mm. 12 pcs./box. 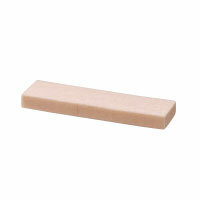 Replacement inking pad for Lion numbering machine B-type and MM-21. Size: W40 x D11 x H7mm. 12 pcs./box. Replacement inking pad for Lion numbering machine C-type. Size: W29 x D11 x H7mm. 12 pcs./box. Replacement inking pad for Lion numbering machine D-type. Size: W25 x D11 x H7mm. 12 pcs./box. 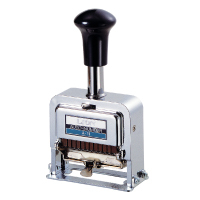 Replacement inking pad for Lion numbering machine M-type. Size: W93.5 x D23 x H7.5mm. 3 pcs./box.